Fresh, tasty seafood is widely available in Mooloolaba. I don’t think there’s a better way to end the day then with a nice big bowl of Mooloolaba Prawns and a crisp glass of white wine. Mooloolaba Prawns are a good looking crustacean and are bigger, richer and stronger than other prawns. If you don’t fancy seafood then there’s plenty of other options including Italian, Thai, Japanese and more Mooloolaba Restaurants. Fish on Parkyn is an fishy institution located at Mooloolaba Wharf. It opened its doors in 2003 and has become one of the Sunshine Coast’s leading restaurants. Sit down to dine at lunch or dinner on several varieties of reef fish, Mooloolaba prawns, scallops, Moreton bay bugs, mud crabs, sand crabs and much more. Recently they opened Sakana Sushi Bar next door to utilise the huge variety of fresh fish. Augello’s is an award winning restaurant specialising is modern Italian fare served for lunch, dinner and as take away and home delivery options. Choose to dine alfresco on the deck downstairs and watch the passing parade on The Esplanade or head upstairs for incredible views of the ocean. Augello’s is a favourite with locals and tourists and was an International 2010 Winner of the Global Pizza Challenge for their smoked salmon pizza. The Surf Club sits on the edge of the Pacific Ocean on Mooloolaba Beach and serves up fantastic food day and night. The Deck is a relaxed cafe with a great selection of snacks, sandwiches and meals served throughout the day. The Boathouse Restaurant is a family friendly restaurant and has a great menu ranging from pizzas to hot and cold seafood platters, curries, pasta and all your other favourites. Most of the restaurants and cafes in Alexandra Headlands run along Alexandra Parade and overlook the beach. There’s a large array of restaurants to choose from including modern Australia, Thai, Indian and plenty of fresh fish and seafood to enjoy while you watch the sun go down over the sea. One of Alex’s favourite dining destinations is the Alex Surf Club located right on the beach and offering panoramic views of the area. The Surf Club offers diners three restaurant choices, all of which are well priced and generous. Maroochydore has the greatest selection of eats on the Sunshine Coast. Here you will find your standard fish’n’chips and steak joints but also fantastic Spanish tapas, Moroccan, Japanese, Thai and many more cuisines from around the globe. Take a look at all of the Maroochydore restaurants. 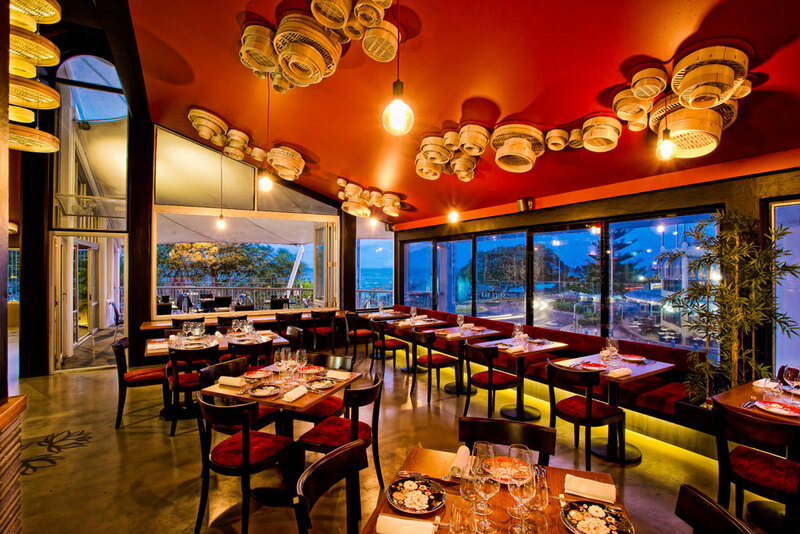 ba Vigo perfects a mix of Spanish culture and the beauty of the Sunshine Coast with its stylish yet relaxed food and restaurant. The chef Nick Belton specialises in modern Spanish and North African care and uses only the best local produce. It’s a unique restaurant and is a favourite with tourists and locals for a night out in Cotton Tree. The Boat Shed Restaurant embodies everything that Sunshine Coast dining should be about – it’s casual, relaxed and offers beautiful coastal views. It is an ideal place to while away an afternoon on one of the comfy couches, with a bottle of wine and a plate of tapas and views over the Maroocy River, Mt Coolum and fat pelicans. The seafood here is amazing but if you’re not into fish there’s also plenty of other dishes to take your fancy. The Maroochydore Surf Club is one of the most respected clubs in Queensland and also has some of the best views in all of Maroochydore. Come here for a casual lunch or dinner Monday to Sunday or breakfast buffet on a Saturday and Sunday. It’s a family friendly restaurant with well priced meals with plenty of flavour. It’s a great place to enjoy a beer while watching the sun set. 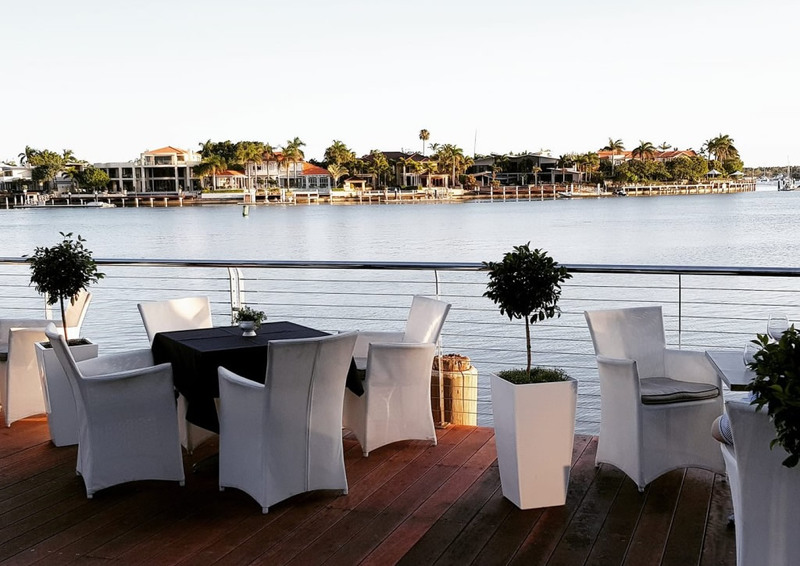 See Restaurant is the only restaurant in Mooloolaba that offers over-water dining. Our all-weather intimate space seats up to 70 people where the focus is on the menu. We offer Modern Australian cuisine using the freshest seafood straight from the trawlers that call our harbour home. Fully licensed with a fantastic cellar selection and seasonal cocktails, See is the ultimate waterfront dining experience and offers the perfect setting for a romantic evening or dinner with friends enjoying the iconic coastal lifestyle. See is open from Tuesday to Saturday 10am till late & Sunday for lunch. Aaron & Kym-Sarah Ruttan created Spice Bar Restaurant 8 years ago. After 2 years in South Australia’s Southern region and 4 years on the backstreets of Mooloolaba on the Sunshine Coast, Spice Bar Restaurant’s third re-incarnation is the biggest and best of them all at First Floor 123 Mooloolaba Esplanade. Incorporating cutting edge design, open kitchen, bar and outdoor balcony seating, private function areas with an amazing view of the Pacific ocean off Mooloolaba. Our philosophies remain the same, focusing on top quality food and service provided by our highly experienced and passionate team.